For your convenience, WE Cinemas facilitate your use of certain third party services that enable the use of accepted credit cards to make payment for movie tickets booked on-line or for your use of other Website Services ("Payment Services"), from or through this Website and Mobile Devices. Such Payment Services are provided by third parties and are the sole responsibility of such third parties. Please consult these third parties on any matter arising in connection with the Payment Services. Tickets sold by WE Cinemas at the prices displayed for the relevant performance and the amount payable for them will be debited immediately from your credit or debit card. By requesting tickets through the Website you are placing a booking request on these Terms which is only accepted and binding on us once your payment through your card has been debited, the Website will send you a confirmation booking reference which will be emailed to you. WE Cinemas treat all transactions and customers' particulars with the strictest confidence. However, the Internet is not entirely secure and whilst we will take reasonable steps to safeguard the security of any card information you impart, we shall not be liable for any damage you may suffer as a result of the loss of confidentiality of any such information. (8) All movie show dates and show times are correct as per published but the management reserves the right to change the film schedules and ticket prices by posting the changes on line without prior notice. We will strictly not entertain any cancellations and / or exchange by the customer once the order is confirmed by, and paid for by the customer. All tickets, Food & Beverages, Movie Gift Cards and Vouchers sold are non-exchangeable and non-refundable. In accordance with the Singapore law, WE Cinemas are required to refuse admission to anyone who is below the minimum age required by the relevant classification. No refunds or exchanges will be entertained for patrons who have purchased tickets to rated movies for which they are not permitted admission into. - Suitable for all ages. Everyone is admitted. - Suitable for most but parents should guide their young. No age-restriction for admission. - The PG13 rating is given to films with content deemed unsuitable for young children but for which a NC16 rating is not warranted. Suitable for persons aged 13 and above but parental guidance is advised for children below 13. - Nobody under age 16 is admitted. - Nobody under age 18 is admitted. - Nobody under age 21 is admitted. For more information on the new rating system implemented by the Media Development Authority, please visit here. (6) You do not agree to submit to any search for any prohibited items including but not limited to weapons, controlled, dangerous and illegal substances and recording devices. (7) You do not meet the minimum age requirement of the relevant classification of the movie. No refunds or exchanges will be entertained for patrons who have purchased tickets to rated movies for which they are not permitted admission into. (6) Patrons are required to follow all house rules and regulations set out by WE Cinemas. The House Rules are displayed within our premises. You agree that we reserve the right to refuse entry to you or to remove you from WE Cinema's premises if you do not comply with the House Rules and / or at its discretion without giving any reason whatsoever. In such event, WE Cinemas reserves the right to refund the price of tickets at its own discretion without giving any reason whatsoever. (7) WE Cinemas will not be held liable for unsuccessful attempts to contact contest winners for promotions it holds. a. You agree to abide by the House Rules and regulations set by WE Cinemas when you patronize WE Cinemas, and you agree that WE Cinemas reserve the right to refuse entry to you or to remove you from WE Cinemas' premises if you do not comply with these House Rules and/or at its discretion without giving any reason whatsoever. In such event, WE Cinemas reserve the right to refund the price of tickets at its own discretion without giving any reason whatsoever. b. You agree that WE Cinemas reserve the right to change or cancel the show times of any movie at any time without prior notice to you and that WE Cinemas shall not be liable to you or any third party for such cancellation or change. In such event, WE Cinemas shall refund to you an amount not exceeding the ticket price. c. You agree that WE Cinemas shall not be liable to you for any direct, indirect and/or consequential losses, damages, injuries suffered by you within WE Cinemas' premises, arising from any acts or omissions of WE Cinemas, its staff and/or its other customers/patrons whether those acts or omissions were negligent or otherwise. You agree to release, waive, discharge and covenant not to sue WE Cinemas, its employees, agents, contractors or partners (hereinafter referred to as “Released Parties”) for any loss or damage, and not to make any claim or demands therefore on account of any injury or death to to yourself arising out of or resulting from or related to your patronage at WE Cinemas whether caused by the negligence of the Release Parties or otherwise. d. You agree to indemnify and save and hold harmless the Released parties and each of them from and against all proceedings, suits, actions, claims and demands, as well as any loss, liability, damage, cost or expenses which may be taken or made against them or which they may incur in respect to injury (including fatal injury), loss due to your patronage to WE Cinemas, destruction, or damage of property suffered by them, or by yourself, arising out of or related to your patronage at WE Cinemas, whether caused by the negligence of the Released Parties or otherwise. You agree to assume full responsibility for any risk or bodily injury, death, or property damage to myself arising out of or related to your patronage at WE Cinemas, whether caused by the negligence of the Released Parties or otherwise. e. You agree that you are aware of and give consent to WE Cinemas for photography, filming, videotaping and/or audio recording or other means of capturing my images or voice, through means that is not limited to CCTV, during your patronage at WE Cinemas and/or being quoted in the media or printed materials (including social media websites). f. You agree that you have read and fully understood the Terms and Conditions and that your purchase of WE Cinemas' tickets shall be deemed as an irrevocable and unconditional agreement to the terms and conditions and as a complete and unconditional release of all liability to the full extent allowed by the law of Singapore. The Website Terms set out the legally binding terms which apply to everyone who accesses through Website, including mobile devices and mobile applications. By accessing through the Website you agree to be bound by these Website Terms. If you do not wish to be bound by these Website Terms you must leave the Website immediately, or not enter it at all. 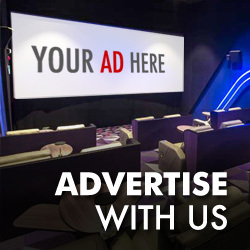 The Website is provided free of charge and WE Cinemas make no guarantee that it will be uninterrupted or error free. In addition, we reserve the right to modify or discontinue, temporarily or permanently, all or any part of the Website without notice and without liability. The materials on the Websites are protected by copyright, trade mark and other intellectual property rights and laws. The materials on the Website are owned by or licensed to us and may not be copied, reproduced, republished, uploaded, posted, transmitted or distributed in any way without our consent. The Website contains links to other website which are not controlled by us. Such links are only provided for your convenience and you access them at your own risk. In the sole discretion of EW, in exceptional circumstances, such as a national emergency, security concern, or other situation in which EW deems such disclosure is prudent. (2) Access to and Correction of Your Information. You may request to access or correct (including update) your information by emailing us at wecinemas@engwah.com.sg, and with an administrative fee of $100 + prevailing GST. Please note that subject to the PDPA, not all information that we have collected may be available for review. We reserve the right to update these Terms and Conditions from time to time. Your use of the website or mobile application after these Terms and Conditions have been updated, will be deemed acceptance of the updated Policy.